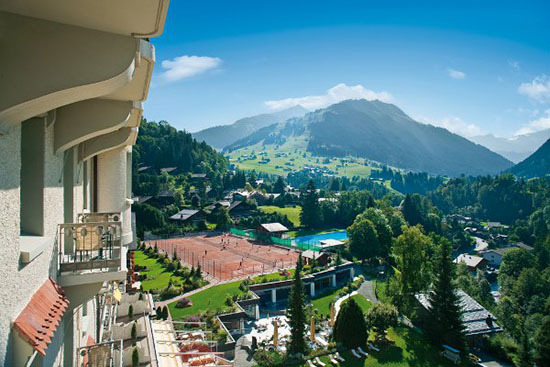 I adore Gstaad Switzerland, so much so, I envision myself moving there full time in the not so distant future. 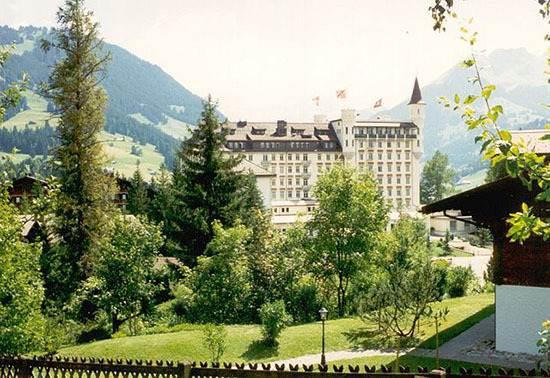 Gstaad is a bilingual village in the German speaking section of the Canton of Bern in Southwestern Switzerland. It is home to one of the largest ski areas in the Swiss Alps and has a marvelous picturesque promenade in the middle of the village that includes numerous shops, restaurants, and art galleries. 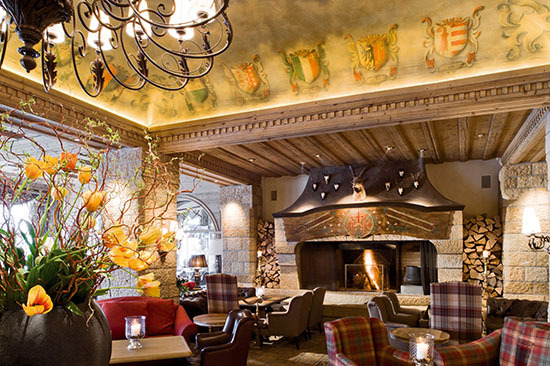 On my recent three week visit I stayed at the Gstaad Palace and found the service and accommodations exceptional. The attention to detail and opulent surroundings convey tradition and refinement while embracing modern day technology. On a beautiful sunny afternoon underneath enormous yellow striped umbrellas at Le Grande Terrasse I had the pleasure of sitting down with Andrea Scherz. He is the third generation proprietor of the Palace which has been in existence since 1913. There is a deep love and commitment that I instantly see when we begin to discuss this glamorous Hotel and all its history. 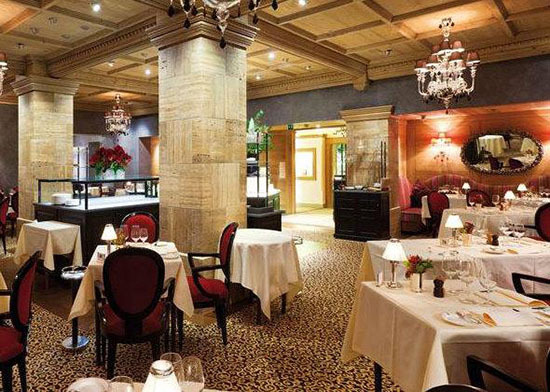 After graduating from the Hotel management School in Lausanne, and following various training periods and jobs in Switzerland as well as abroad, Andrea began working in his Fathers business as Chef de Reception in 1996. He then after some years was appointed General Manager, a position that fit him perfectly. 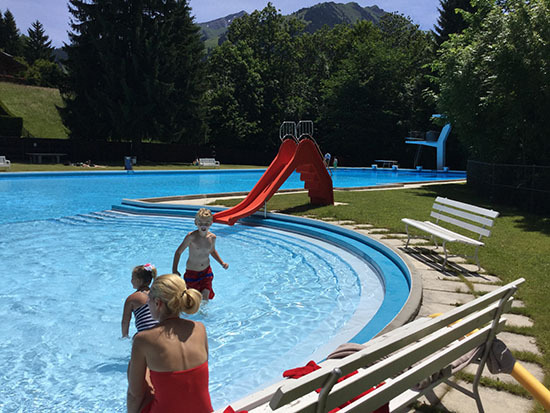 The Palace has an array of activities for guests, including the Spa and Swimming pools….there is a fabulous out door Olympic size pool that is ideal for children. It is heated and has a lush lawn surrounding the cool blue water so the children are free to run around and enjoy themselves. There is a wonderfully kind man by the name of “Tom” that took such good care of us. My little daughter knew him by name and would always greet him and be sure to say goodbye. There are many devoted employees at the Palace that have been there for decades making it a magical place. The Olympic size pool…wonderfully fun! One such employee is Gildo, of Gildo’s Ristorante in the Palace. He has been with the Hotel since the sixties. He is the head Maitre D’ and I had one of his divine pasta dishes prepared table side on the La Grande Terrassa. It was cooked perfectly and extraordinarily fresh as authentic Italian Cuisine should be. There is no request to large or small that the Hotel Staff will not accommodate. 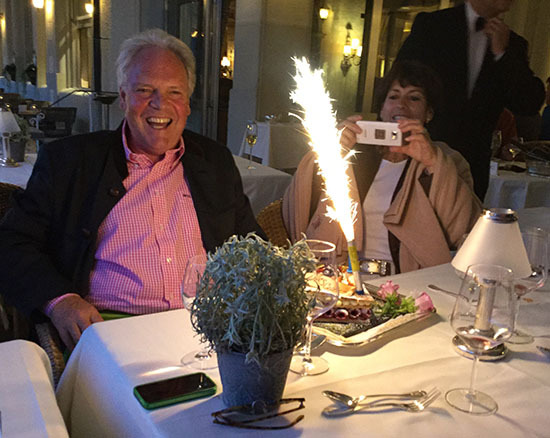 One evening while dining, I discovered it was the birthday of a new friend. I immediately excused myself from the table and found the assistance of the chef who eagerly agreed to make a large birthday cake with candles. At the end of the meal the most extraordinary cake arrived with a fire cracker sparkler on top….it was absolutely perfect!!! This type of accommodating service is legendary at the Palace, which is comforting beyond measure when far away from home. 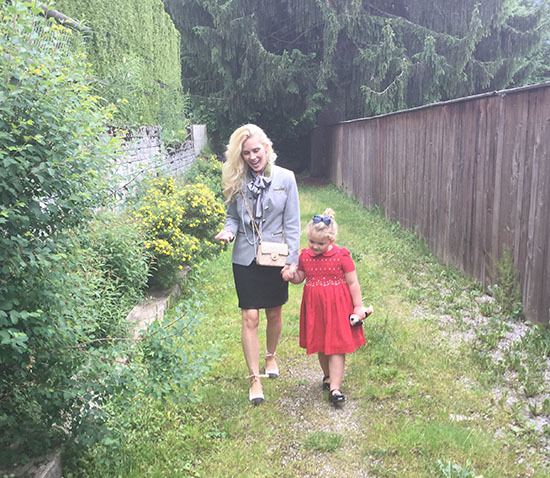 Strolling the Palace grounds with my daughter Hyacinth. Andrea believes tradition and respect are paramount in running a five star Hotel. His enthusiasm about his work is inspirational and clearly motivates those around him. 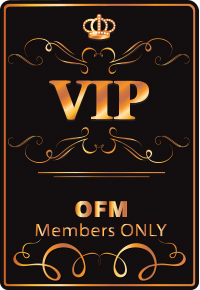 He is committed to excellence and maintains high standards for his guests to enjoy. 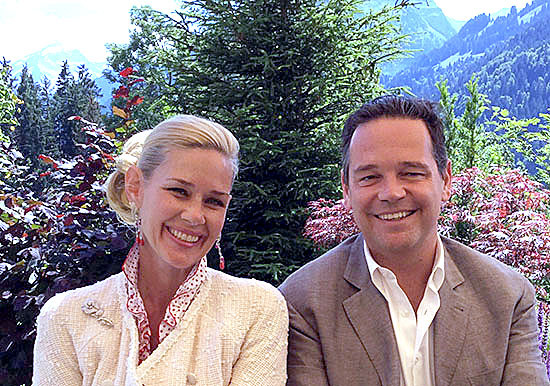 I look forward to my return and will be sure to organize my paints and easel while there as the Swiss Alps are breathtaking and I can’t wait to capture the magnificence and splendor of it all on canvas. 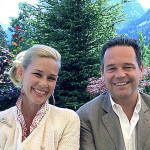 Michelle-Marie Heinemann & Andrea Scherz. Such a lovely conversation……and delightful day!